When Sound Transit managers insisted it would be OK to mix and match elements of a potential West Seattle to Ballard light-rail plan, they might not have envisioned the level of mixing and matching that went on tonight at the first of four milestone meetings. Members of the all-volunteer Stakeholder Advisory Group concluded their 14-meeting role in the planning process with a jumble of recommendations – and, for a few segments, non-recommendations. So if you were hoping to hear and see something simple like “they voted to recommend the (x) line,” sorry, it didn’t go that way. -In The Junction, the with-third-party funding option would be a tunneled station at 41st or 42nd; the without-extra-funding option would be a modified version of the elevated “representative alignment” (red) that could either end at Fauntleroy or at Jefferson Square, or saving money by tunneling but consolidating the Junction and Avalon stations. -The Elected Leadership Group meets 9:30 am Friday, April 26, to make its recommendations, taking into account what the SAG said tonight as well as the 2,700 “scoping” comments received (here’s the PDF summary/”themes” report on those). ADDED 3:33 AM THURSDAY: If you need a refresher on the aforementioned red vs. orange vs. blue routes, see pages 22-26 of the meeting deck (PDF). (Here’s the PDF.) The “scoping” comments are to be summarized by ST with “themes” made available to the Stakeholder Advisory Group a few days in advance of its meeting April 19th, at which SAG members will make a recommendation of routing/station options that they think should go into environmental study. One last time, here’s how to submit yours – by end of day today. Two days remain until Sound Transit closes the “scoping” period – the last round of official public comment before a decision on which light rail routing/station locations to send into environmental study. The West Seattle-to-Ballard project’s Elected Leadership Group met Friday for a bonus briefing/discussion on the Delridge and Chinatown/International District station options. This is the group that will meet in four weeks to decide on what to recommend to the Sound Transit Board, which has the final say on everything from what to study to what to build. Does the solution improve the quality of life for residents ( i.e. customers and business owners) who live and work in and around the proposed alignments and station locations? Does the solution improve the movement of people and commerce? Does the solution minimize the disruption to economic activity during and after construction as well as provide suitable mitigation measures? Back in November 2017, the Junction Neighborhood Organization hosted a briefing with Sound Transit, at which a top ST manager promised “an interesting year and a half” ahead. That year and a half is almost over; May is when the ST Board will decide which routing/station locations for West Seattle light rail will go into environmental studies. But as another JuNO briefing with ST showed last night, some local residents are just starting to sit up and take notice, especially since multiple locations are now in play for the Junction station. An upstairs meeting room at the Senior Center/Sisson Building in The Junction filled to overflow capacity for last night’s briefing and Q&A. ST’s Leda Chahim reassured them that “this is a really good time to be engaging,” though the “scoping period” for public comment ends one week from today. First – here’s the slide deck Chahim and other ST reps used to recap where things stand. What routing and station locations will be deemed “preferred” for West Seattle light rail? Key decision deadlines are headed this way fast. JUNO MEETING TONIGHT – The Junction Neighborhood Organization is focusing its meeting on light-rail routing, 6:30 pm tonight (Monday) at the Senior Center of West Seattle (4217 SW Oregon). This is one place for you to have a say, along with the online open house. They’re advocating for tunneling into The Junction and, in particular, opposing the “orange” elevated routing (their materials call it the “yellow” line), not only because it could take out an entire residential neighborhood but also, they say, because it would predetermine how light rail would expand south – taking out even more homes. Go here to see the flyer they have been circulating, as well as their proposed alternative. That’s Bowman at left above with Dennis Noland, a longtime area property owner who’s been leading the neighbors in advocacy against the Youngstown-area station location. She’s a member of the Elected Leadership Group, which will make a routing/stations recommendation next month to the ST board. When Sound Transit light rail arrives in West Seattle – projected start date, 2030 – after the trains cross the Duwamish River on a new bridge, that’s where the easternmost of three planned stations will be. And that was the topic of this past Tuesday’s “community workshop” at Youngstown Cultural Arts Center, which might end up adjacent to the station if the southernmost proposed site is chosen. As is standard for Sound Transit’s meetings, this one began with a lengthy slide-deck-accompanied presentation that plowed through the highlights of the yearlong planning process that is almost to a key destination – the decision about which route(s) and station locations will get full environmental study. When West Seattle light-rail construction begins, “we’re going to be the first area in West Seattle impacted,” explained Pete Spalding as he opened last night’s Pigeon Point Neighborhood Council meeting, with Sound Transit guests in the spotlight, nine months after ST’s last PPNC appearance. Which “preferred alternative(s)” will go into formal environmental study? With the Sound Transit board set to make that decision in May, the last major public-comment period – aka “scoping” – is under way now. And it’s bringing together groups of neighbors focused on what the decision could mean not only to their neighborhoods, but to the rest of West Seattle – and beyond. We sat down the other day with five people who are part of the newly organized East Alaska Junction Neighborhood Coalition. They support tunneling light rail into The Junction. 6:41 PM: You have until 8:30 pm to get to Sound Transit‘s West Seattle light-rail open house. Big turnout already, and a presentation is getting under way, but even after it, plenty of time will remain to “learn and share,” as the crowd has heard. The latter involves commenting on the “latest route and station alternatives,” “topics to study in the environmental impact statement,” and “project purpose and need.” County Councilmember Joe McDermott spoke briefly – he’s a member of the ST board and emphasized the importance of input now, even if you have commented before – now that it’s the official “scoping period,” they need to hear from you again. That gets you into “the official federal record,” as noted by ST’s Cathal Ridge. He also told the crowd that even though discussions and reviews have been under way for more than a year, this still is “the beginning of the process” as they move toward a board decision this May on what to send into environmental study as the next major step in the process of opening West Seattle light rail in 2030. Tonight’s open house is at the Masonic Center (4736 40th SW); if you can’t make it, you can comment via this “online open house” until March 18th. 7:02 PM: The presentation – which recapped the currently under-consideration alternatives (though you can tell ST you want to see something else considered) and where the process stands – is wrapping up. (UPDATE: HERE’S THE SLIDE DECK.) What happens next – the “open house” info tables, easels, etc., remain open. They are also inviting people to have conversations at “neighborhood forum” tables around the room, but made it clear that they are not taking notes at these tables because they want your comment(s) to be on the record, so if you want to comment here, seek out one of the official comment stations – or make it via the online open house or e-mail, postal mail, or phone. There are also two more in-person open houses, one of which is tomorrow in Ballard. Info on that and the commenting alternatives is all here. Those attending an open house will hear information and have the opportunity to provide feedback on the alternatives for expanding light rail to West Seattle and Ballard. Feedback from this comment period will be shared with the Stakeholder Advisory Group and Elected Leadership Group to inform their recommendations to the Sound Transit Board of Directors on alternatives to study during environmental review. In May, the Board will identify a preferred alternative and other alternatives to study in a Draft Environmental Impact Statement. 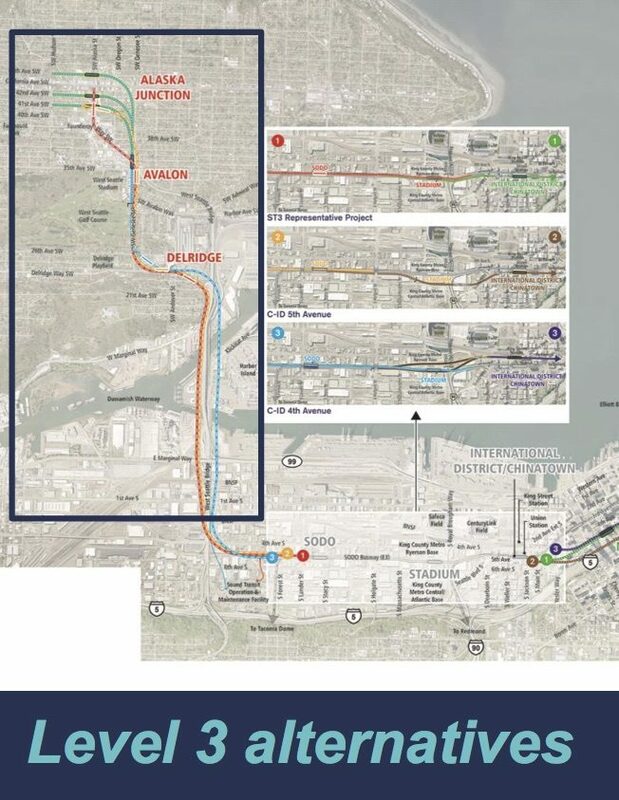 Sound Transit and the Federal Transit Administration have officially kicked off scoping for the West Seattle and Ballard Link Extensions project. Scoping is the next step in the environmental review process and provides an opportunity for you to comment on the route and station alternatives, topics to study in the environmental impact statement, and project purpose and need. This 30-day public comment period will include multiple ways for you to share your feedback and help the Sound Transit Board identify a preferred alternative and other alternatives to study in an Environmental Impact Statement during the next phase of project development. Comments must be received by March 18. Your feedback will be shared with the Stakeholder Advisory Group, Elected Leadership Group, and the Sound Transit Board prior to their recommendations on which alternatives should be studied during environmental review. The Sound Transit Board will identify a preferred alternative and other alternatives to study in an Environmental Impact Statement in May 2019. We’re excited to share dates for our upcoming scoping open houses in West Seattle, Ballard, and downtown Seattle. We hope you’ll join us at one of the meetings below to learn more about the alternatives being considered, ask questions and share your comments. Can’t join us in-person? Our online open house is now live! Visit wsblink.participate.online and submit your scoping comments by March 18. The Stakeholder Advisory Group and Elected Leadership Group recently held meetings to review the latest alternatives and hear more about the Level 3 evaluation results. The three end-to-end alternatives were evaluated based on their performance with respect to dozens of qualitative and quantitative measures, such as service reliability, travel times, environmental effects, technical feasibility and much more. Other project documents, including a Scoping Information Report, the State Environmental Policy Act (SEPA) Determination of Significance, and evaluation reports, are also available for review online. One thing we noticed while browsing the “online open house” before publishing this announcement – you can access a PDF with visualizations of the currently proposed “end-to-end alternatives” – see it here. P.S. We’ve been covering all the other steps in the process along the way – most recently, the Stakeholder Advisory Group‘s meeting two weeks ago. The process of arriving at a “preferred alternative” for Sound Transit‘s West Seattle/Ballard light rail routing and station locations will stretch further into spring than first planned. That’s part of what was announced at last night’s Stakeholder Advisory Group meeting, which was centered on releasing and discussing how the currently under-review possibilities compare on a variety of criteria, including cost. The same information will be reviewed by the Elected Leadership Group tomorrow morning, and your feedback will be sought online and via in-person forums in a month or so. Sound Transit plans to begin drilling to collect soil samples for analysis on SW Genesee St between 26th Ave SW and 30th Ave SW. as early as January 28. Work will occur from 8:00 a.m. – 4:00 p.m. and take approximately five days to complete. The eastbound lane and sidewalk of SW Genesee St will be closed between 26th Ave SW and 30th Ave SW during working hours. Flaggers will be present to direct eastbound and westbound traffic around the work area. Metro Route 50 will continue to operate on SW Genesee St.
Sound Transit is in the early planning phase for the West Seattle and Ballard Link Extensions project. This work, along with similar borings throughout the project corridor, will help us plan and design possible light rail alignments. The list provided by ST shows testing at Terminals 18, 25, 102, and 104 should have been completed by now; work in the park at Harbor Island is planned through tomorrow, and night and weekend work at 3568 W. Marginal Way SW through Sunday. The technical analysis continues as ST enters the final phase of review to choose a “preferred alternative” for environmental study; that decision is expected this spring. Next steps in the review process, two meetings next week. Light rail does not just appear one day in a neighborhood where it didn’t exist the day before. Years of construction follow years of planning. Some of that construction is preceded by demolition – tearing down homes and businesses that, to put it bluntly, are declared to be in the way. That will happen to some in West Seattle. Just where, and how many homes and businesses, won’t be settled until the route and station locations for the due-to-open-in-2030 line are finalized. But some people for whom it’s a possibility are already grappling with it. 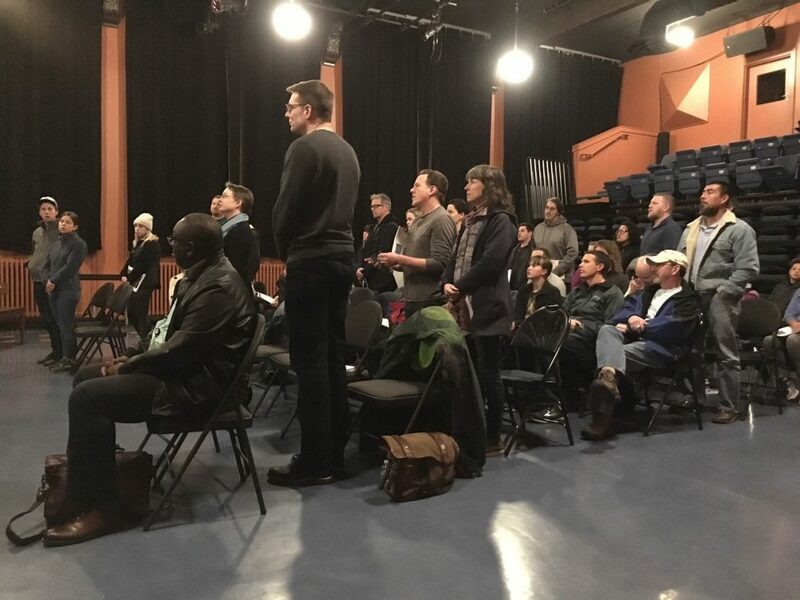 This past Wednesday night, dozens of them gathered at Youngstown Cultural Arts Center with pointed questions for Sound Transit – questions that in many cases, ST reps said, it’s too soon to answer. Most of the people in attendance were from nearby streets where construction of the Delridge station might push them out, depending on what location is chosen. The briefing/Q&A event was organized by a neighbor, Dennis Noland, who opened by saying, “It was devastating news to me” to find out that Sound Transit’s West Seattle light-rail plan might cost him and some of his neighbors their homes. Noland took it on himself to personally talk with neighbors after that revelation last fall. That was the welcome last night for Sound Transit‘s West Seattle-Ballard light rail Stakeholder Advisory Group members at their last scheduled meeting of the year. Here’s the full set of ELG recommendations from todaySeattle Channel website eventually, as SC has recorded the ELG meetings because the group’s membership means the meetings technically also qualify as Seattle City Council Sustainability and Transportation Committee meetings. WHAT’S NEXT: The third and final level of review now begins, with a “preferred alternative” for environmental study to be arrived at next spring. The next public meeting in the process isn’t until late November, when the Stakeholder Advisory Group is scheduled to meet again. ADDED SATURDAY: Here’s the video of the meeting. Two levels of review down, one to go until the Sound Transit West Seattle to Ballard light-rail-extension project focuses on a “preferred alternative” for environmental study. At their 3+-hour meeting tonight, members of the project’s Stakeholder Advisory Group made its recommendations for which alternatives its members want to see advance to the third level of study, segment by segment – Ballard/Interbay, Downtown, Chinatown/ID, SODO, and finally, West Seattle – seated in four groups, with the results collected and announced after each segment discussion. 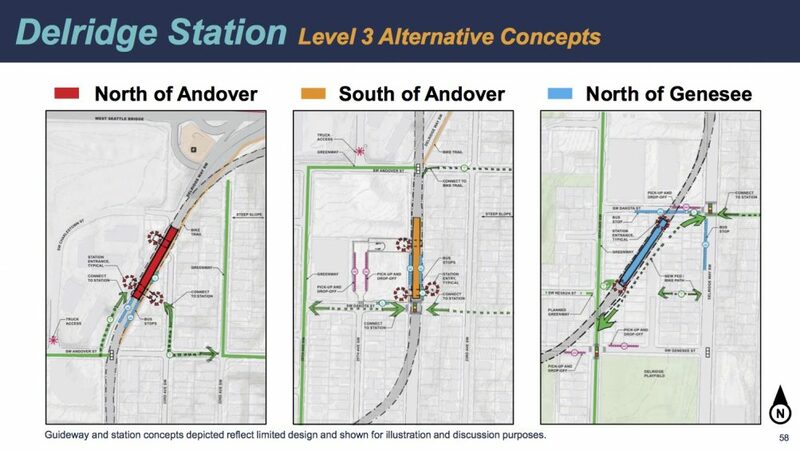 The alternatives that are advancing are from among five under review in Level 2, including the ST “representative project” (the all-elevated plan that was originally outlined before the ST3 ballot measure). 9:13 AM: Not here at the Seattle Lutheran High School gym (4100 SW Genesee) yet? More than 50 people are, as the Sound Transit “neighborhood forum” for West Seattle light rail routing/station locations begins. This is in “open house” – circulate and look at boards, maps, etc. – mode until at least 9:30, followed by a presentation, followed by small-group conversation starting just before 10, so you have time to get here. (The format is detailed here.) Here’s our most-recent coverage, with the new ST-released “visualizations” of what some of the route/station options might look like. Updates to come! Ridge reiterates that they’re not asking people to pick their final preferred alternative today, but to help “narrow” the list down. One more level of review is ahead before that preferred alternative is finalized next April, to move into full environmental study. Ridge notes that this is the first time “cost assessment” has entered the process (as we reported last Wednesday) – focused on “limited conceptual design” (5%, compared to 60% when they get to an actual project budget) based on “consistent methodology” including 2017 dollars. In the final level of review, Level 3, they will provide costs for “end-to-end alternatives,” compared to the current comparative segment-by-segment analysis, and those, Ridge explains, “will facilitate comparison to ST3 budget” (as approved by voters). 10:20 AM: Presentation’s ending. That means table-by-table conversations will begin. ST has a note-taker assigned to each table. It’s announced that City Councilmember Lisa Herbold is here. Someone asks if the slides can be made available online – the facilitator says yes. (Again, as noted above, the same slides were in the Wednesday presentations, but we’ll request today’s deck on Monday and add it here.) We’re within earshot of one table, whose note-taker/coordinator KaDeena Yerkan is asking people to introduce themselves and to say which station/route segment most interests them. One person in her self-intro says she’s interested in whatever would speed up the process. ST, meantime, tells us that the signup forms at last check showed 130 people are (or have been) here. The boards with post-it note options are still up for commenting on the other side of the room, too. If you couldn’t be here, you still have a way to get involved in this round – as we reported Friday, ST has an “online open house” now under way until September 23rd, with info and comment opportunities. Find it here. The road to choosing a “preferred alternative” for West Seattle/Ballard light rail has now taken the Stakeholder Advisory Group into the second of three levels of review. When the SAG met last Wednesday at the Sound Transit board room downtown, it was presented with five West Seattle possibilities – including two new/modified versions of pre-existing options. You can see all five in the slide deck from the meeting. Sound Transit‘s West Seattle light-rail line is either going to skirt Pigeon Point or tunnel through it, so the PP Neighborhood Council invited ST in for a briefing. The briefing and ensuing Q&A took up most of last night’s semimonthly PPNC meeting, with about 50 people in the Pathfinder K-8 cafeteria to get an abridged version of what’s been unfolding over the past 5+ months. ST’s Andrea Burnett and Stephen Mak, both working on the West Seattle line plan, were invited. He presented the backstory first on the Sound Transit 3 vote setting up a draft plan for a 4.7-mile extension to West Seattle, to open in 2030, with a new rail-only bridge over the Duwamish River, and three stations in WS.